As a second-year nursing student I have been working as a healthcare assistant to gain more clinical experience and increase my self-confidence when caring for patients. On an evening shift on a specialist palliative care unit, I was helping to care for a bay of three female patients, aged between 65 and 90. They all had different forms of cancer and had been admitted to the unit for the management of symptoms that were affecting their daily living, including nausea, poor appetite and drowsiness. The area in Bournemouth where I was working was having bad weather that had caused the bedside televisions to lose their signal. To help pass the time, the patients started singing songs from their youth. They were having a lot of fun doing this, but one of the patients told me they kept struggling to remember the words of the songs, which was causing them some confusion. After seeing how much the singing had cheered the patients up, I wanted to help them recall the words to the songs. So during a quiet period on the unit, I created a booklet with lyrics of songs from the 1950s to the 1970s, including hits from Elvis Presley, the Carpenters and more. As I approached the patients with the printed lyrics, I was welcomed with the warmest of smiles. I showed each patient the books I had made, and gained their approval of the chosen songs. We all sang along and the bay was full of laughter and smiles, an experience I will remember for many years to come. The happiness was contagious – when a male patient in another bay heard the singing, he joined in and also started dancing to the tunes. What struck me the most was how a quiet room of very unwell patients was lit up by such a small act. 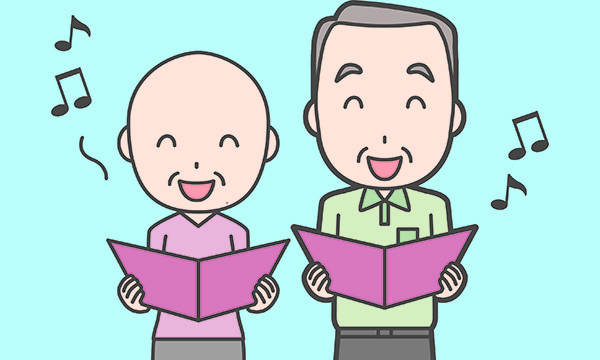 Singing brought the patients together and created a real sense of community. This was a really rewarding experience. It helped me to realise the huge impact the smallest act of kindness can have on patients, and the role peer support can play in maintaining patients’ emotional and physical well-being. Most of all, it taught me the importance of an holistic, patient-centred approach to care, which I will carry with me throughout my training and my practice after I graduate. When I become a qualified nurse I may not always have as much time to spare, but I will always remember the ability I have to help improve patients’ well-being and will adopt a person-centred approach when caring for my patients. Being able to brighten up someone’s day when they are particularly vulnerable is one of the greatest things about being a nurse.